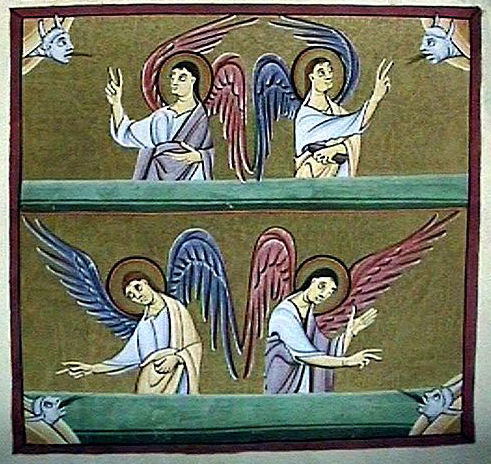 Four Angels Hold Back the Four Winds of the Four Corners of the Earth, from Folio 17, The Bamberg Apocalypse, 1000-1020 A.D., Bamberg State Library. Public domain. Episode Twelve, the newest episode in Revelation: An Idealist Interpretation was uploaded to our You Tube channel this morning. It’s loaded with illustrations from The Bamberg Apocalypse, an illuminated manuscript made between 1000 and 1020 A.D. at the Scriptorium at Reichenau, Germany, under authorization by the Holy Roman Emperor Otto III. The monks and scribes put St. John’s powerful images into print form in watercolor and gold leaf on vellum. I’ve used Photoshop to make certain adjustments to partially correct for the distortions caused by the way the book was held open for the camera. The next episode, Episode Thirteen, is nearly finished and will be released during the week of June 29th. The subject is Chapter 8, the sounding of the Fifth and Sixth Trumpets. It will include more illustrations from The Bamberg Apocalypse. Last night I uploaded the Podcast Homily for Fourth Sunday After Trinity, which is focused on Romans 8:18-23, with two verses added for clarity and context, and Luke 6:36-42, the lesson on judgment and forgiveness, which includes Jesus’ refernce/question regarding the blind leading the blind. My focus is on the dual nature of the subject matter: first, a lesson on forgiveness for the general audience listening in the 1st Century; and, on a second level, instruction for the Disciples particularly, and by extension the Church, especially the clergy, on forgiveness and Christian virtue applied in daily life. Listen to the Podcast Homily. Thanks for your continued interest in the Anglican Internet Church online ministry. Please visit our web site to access more of the resources we’ve made available to the public.